Jeff Carlson has been doing some incredible work unravelling the Obama administration’s plan to destroy Donald Trump, identifying the corrupt participants, and putting together their interactions that allowed Obama to literally weaponize America’s most powerful agencies. Carlson has put together what must be a 10,000+ word deep dive into the most extensive and potentially most damaging level of corruption by any presidential administration in our country’s nearly two and a half century history. What follows is Carlson’s outline of what his article in the Epoch Times discusses in great detail. -CIA Director John Brennan, with some assistance from Director of National Intelligence James Clapper, gathered foreign intelligence and fed it throughout our domestic Intelligence Community. -The FBI became the handler of Brennan’s intelligence and engaged in the more practical elements of surveillance. -The Department of Justice facilitated investigations by the FBI and legal maneuverings, while providing a crucial shield of nondisclosure. -The Department of State became a mechanism of information dissemination and leaks. -Hillary Clinton’s presidential campaign and the Democratic National Committee provided funding, support, and media collusion. -Obama administration officials were complicit, and engaged in unmasking and intelligence gathering and dissemination. -The media was the most corrosive element in many respects. None of these events could have transpired without their willing participation. Stories were pushed, facts were ignored, and narratives were promoted. To view an expandable version of this graphic click here. 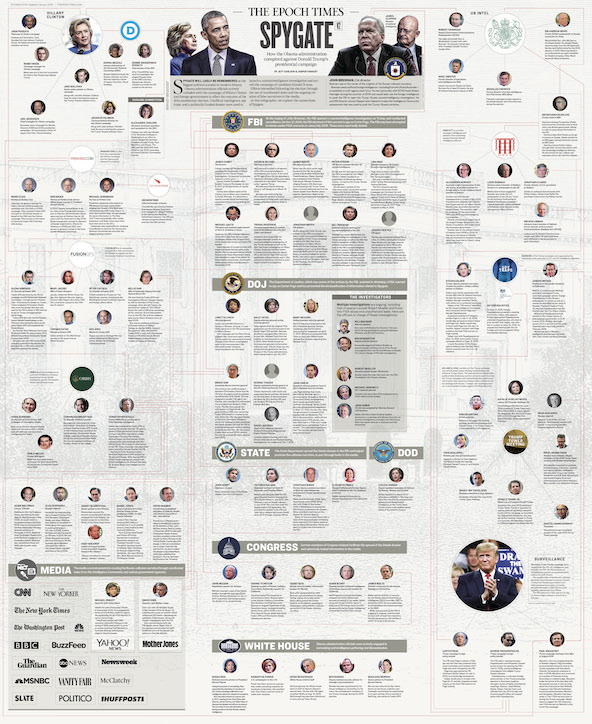 Carlson has charted more than 80 conspirators from inside and outside of government who directly played significant roles in the treasonous Spygate scandal. This includes members of Hillary’s campaign team, the leadership of the DNC, her legal team at Perkins Coie, Fusion GPS, Orbis, the FBI, the Department Of Justice, the CIA, the State Department, Congress, Congressional staffers, British intelligence, Kremlin-linked Russians and the White House. Yes, the White House. There’s virtually no conceivable scenario where the leadership of so many different agencies could, or would conspire to carry out a plan of this magnitude without the approval and facilitation of the president. That number doesn’t include the dozens of print and broadcast media that willingly accepting leaked false information and then reported it in order to both, supply added credibility to multiple fraudulent FISA applications and to create a megaphone with which to tear down a sitting president. The only remaining question is when will President Trump drop the sledgehammer of declassification thereby making it impossible for the corrupt media to continue hiding this treasonous scam from the public? Read Carlson’s full article here.